Decades of research has proven that typhoid prevention and control solutions are efficacious and yield health impact. Ongoing global research continues to build our strong knowledge base, but there is still more we need to know to continue efforts to #TakeOnTyphoid. Typhoid disproportionately affects low- and middle-income countries. Data from ongoing disease surveillance and modeling efforts identify nearly 11 million cases of typhoid and more than 116,000 typhoid-related deaths worldwide each year, largely concentrated in South Asia and sub-Saharan Africa. Of these deaths, an estimated 75 percent occur in Asia. However, the burden is thought to be underestimated given diagnostic challenges and difficulties with surveillance. Drug resistance is an increasing threat. While typhoid can be treated successfully with appropriate antibiotics, the rate of cases resistant to available treatments is increasing globally. Resistance to newer, more efficacious antibiotics for typhoid is becoming more prevalent, particularly in low- and middle-income countries where accurate diagnosis and treatment are difficult. Increased drug resistance raises the urgency for preventive measures such as vaccines, and improved water, sanitation, and hygiene (WASH). Typhoid is preventable. The best way to take on typhoid is through an integrated prevention and treatment approach including vaccines; improvements in WASH; improved typhoid diagnostics; and appropriate antibiotics. Surveillance: Typhoid is more prevalent than originally thought. Surveillance studies aim to create an accurate, comprehensive estimate of the global burden of typhoid. We know that typhoid is a serious problem that can be prevented; continued surveillance enables us to gather better data to inform vaccine programs, as well as monitor drug resistance and new or ongoing outbreaks. The Typhoid Fever Surveillance in Africa Program (TSAP) recently concluded. The project identified a much larger burden in Africa than previously understood. Following TSAP, several multicountry, multiphase surveillance studies are currently being conducted in Asia and sub-Saharan Africa, including the Surveillance for Enteric Fever in Asia Project (SEAP) and the Severe Typhoid in Africa (SETA) Program. In addition to morbidity and mortality data, these studies will provide information on risk factors, socioeconomic impact, and the long-term implications of typhoid. Diagnosis: Typhoid diagnosis is best confirmed through blood culture, which requires laboratory equipment and is difficult to do in low-resource settings. 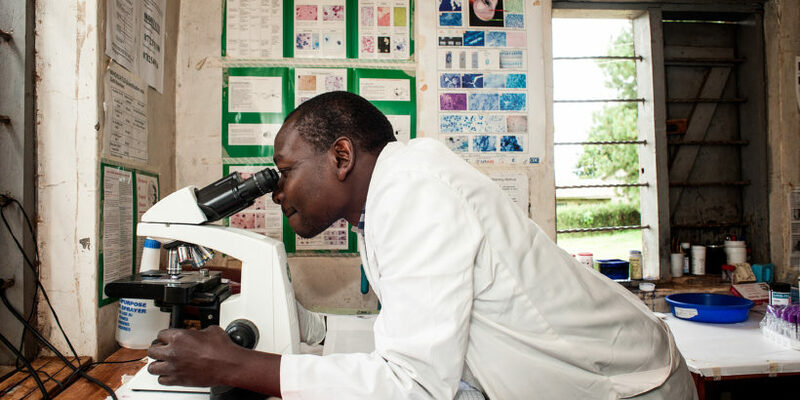 Without access to laboratory equipment, typhoid is typically diagnosed based on clinical symptoms, which can be mistaken for malaria, influenza, dengue fever, or pneumonia. New research and development for more reliable point-of-care diagnostic tests will help improve diagnoses, reduce over-prescription of antibiotics, and increase accuracy of disease burden estimates. Prevention with vaccines: The Typhoid Vaccine Acceleration Consortium (TyVAC) works with governments in low-income countries to introduce vaccine solutions in high-burden typhoid areas. TyVAC is leading research to assess existing data and generate new evidence related to typhoid disease burden, drug resistance, vaccine cost-effectiveness, health impact analyses, and typhoid conjugate vaccines. Additionally, TyVAC is conducting country-level analyses to understand the economics behind vaccine rollouts and to inform decision-makers at the national level. Monitoring drug resistance: The rate of typhoid cases resistant to available antibiotics is increasing globally. Monitoring the spread and patterns of resistance is important to inform effective prevention and control efforts. In 2015, the World Health Assembly endorsed a global action plan to tackle drug resistance; the action plan focuses on prevention, surveillance, and research. The Wellcome Trust and current surveillance projects, including SEAP and SETA, are conducting research to identify typhoid drug-resistance trends and monitor antibiotic use across South Asia and sub-Saharan Africa.